This is one of the most common excuses that I hear from people of why they CAN’T start an online business, or that they aren’t getting any real traction if they already have one. I’ve even used it myself! After all, most of us start an online business in their “spare time” while still holding down a job, and balancing work, family and lifestyle commitments is not an easy task right? And starting an online business can take an awful lot of work, especially in the early stages while we are still learning and trying to get it up and running and making some decent money! But the truth is that productivity and focus go hand in hand with success in our online business more than anything! We all have 24 hours in a day, it’s just how we use that time that matters. 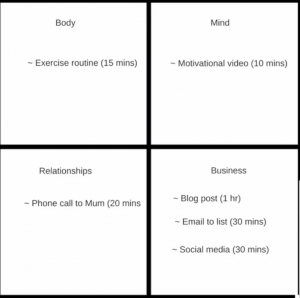 One thing I have been utilising in my business and life lately is a very simple 4 quadrant productivity hack that has been getting some amazing results! Check out this video and I will show you how it works! Don’t be fooled by the simplicity of this hack, it really does work and works really well! Personally, I use a whiteboard that I enter my tasks on the night before, but it can easily be just put on a blank sheet of paper. Money Worries Keeping You Awake At Night? Download The Ultimate Online Marketers Cheat Sheet Bundle And Build The Foundations Of An Online Business Without It Taking Up All Of Your Time Or Costing You A Fortune! You’re right! Starting an online business is REALLY hard. It’s not for everyone and probably 90% of starters will quit because of frustration. As a starter you won’t be earning any money for onths and probably won’t earn a DECENT income for years, but it’s all about not giving up and developing yourself. Learning and applying and creating time for it and NEVER GIVING UP. Successfull internet marketers I know have earned their lifestyle after YEARS OF HARD WORK. And learning time management is one of the important tasks to accomplish. The reality is that building an online business takes a great deal of momentum, but once it’s built up, it has a real snowball effect! Unfortunately, most people never give themselves the TIME to succeed, using excuses that is a scam, or a fraud (which I received an email from someone this morning) or that they lack time, and any other excuse that they can think of! The real answer is that it takes learning new things, stepping out of your comfort zone a bit, a bit of old fashioned hard work, some structure and focus and TIME… It takes many years of schooling and work in any other area of your life to achieve success, but people think they can give a half-hearted effort for a month and expect to be a millionaire with an online business… and when they are not, they get frustrated, use one of their many excuses why it WON’T work… then give up… Sadly many don’t even give themselves a chance to start in the first place!!! Hello, John and happy new year. Your so right with what you said, many make excuses but the truth of the matter is anything worthwhile requires a lot of hard work and time, this is how the road to success is paved but we can set time apart each day no matter how small over time success will be ours. It is all a matter of using our time wisely. We all have 24 hours in a day, it’s just how we use it that makes the difference! Even an hour or two a day… 10 hours a week… and focusing on what is really important to move us forward in that small-timeframe, can really lead to BIG results over time! Sadly, most people don’t give themselves that time to actually succeed! We are all busy… I guess it’s just how much we really want it! We are all struggling with trying to find more time in the day. Although I agree for most of us, we aren’t structuring our days to make the most of the time we have. I think writing out 3 tasks every day is a great way to start your day and get it off to a great start. All of the quadrants are key to maintaining productivity in your life, as well as a happy, grateful life. I love the simplicity of this strategy… now it’s just putting it in to action on a daily basis. Thank you for sharing! I agree Jen, it is the structure and focusing on the most important tasks where we will get the most benefit from this productivity hack! Simple things are often the best, but only if we implement them! Hi John. Nice article on productivity. A lot of people remain unproductive due to not prioritizing their day to day tasks. And this can cripple your business. Especially with the home type of business, and being your own boss really scheduling your tasks is essential. You measure productivity with the tasks accomplished per day. It’s easy to get distracted if you are not careful and get nothing done even though you have been online for hours! I used to spend a lot of time on Facebook with the idea that I was working on my business, but in reality, I have seen very little ROI from my time investment. That’s why I prioritise 3 important tasks to get done that will give me the most momentum, and only when they are done can I move on to other tasks, or playing on FB! Once we get the right structure in place and focus on the most important tasks to complete on any given day, we will be surprised how much we actually can get done! Great post. Love this 4 quadrant productivity hack – you’re so right! Love the video too – I’m more of a visual learner than a reader, so I found this really helpful. Thanks for sharing. Looking forward to reading more on the site. Glad you liked the video Sean and that you found it helpful! Concise and straight to the point. Nice article and perspective. Sometimes the simple things are the best, and using this hack is highly effective to increase your productivity! 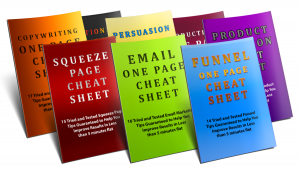 Download the Ultimate Online Marketers Cheat Sheet Bundle: FREE Access! Why Sell Information Products Online? 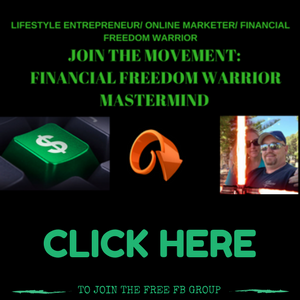 Copyright © 2019 Financial Freedom Warrior.